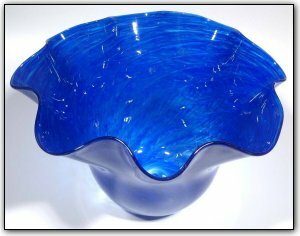 This fluted bowl features shades of blue with subtle white swirling highlights. The highlights are a result of a very thin layer of white in between the inner and outer layers of color. The effect from the white background and resulting highlights produce a truly elegant and stunning effect that are a perfect compliment to the beautiful flutes.